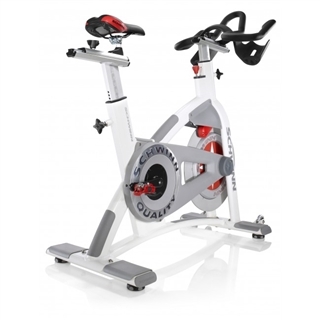 The Schwinn AC Performance bike is a great option for serious cyclists or workout enthusiasts who want the feel of a real lightweight “outdoor” bike in their own home gym, office or fitness studio. Aluminum Frame: This frame keeps the stationary bike light enough that it can be moved, while its design keeps it sturdy and ensures it can handle users up to 350 pounds. The frame on the AC Performance Plus is pearl white. Double Link Pedals: Pedals come with SPD (clip in) and toe-clip combination, therefore giving you options for how you want to ride. They are also compatible with Schwinn Triple Link pedals. Dual Water Bottle Holders: You can spend longer sessions on the AC Performance Plus by keeping two water bottles within easy reach and staying hydrated. Chain Drive System: Uses a forged steel crank and ISIS oversized bottom bracket for smooth performance and authentic cycling feel. Lightweight Performance Handlebars: The light weight makes them easy to grip without weighing down the bike itself or hindering performance. Magnetic Brakes: These magnets brake your bike smoothly and also won’t wear down over time. 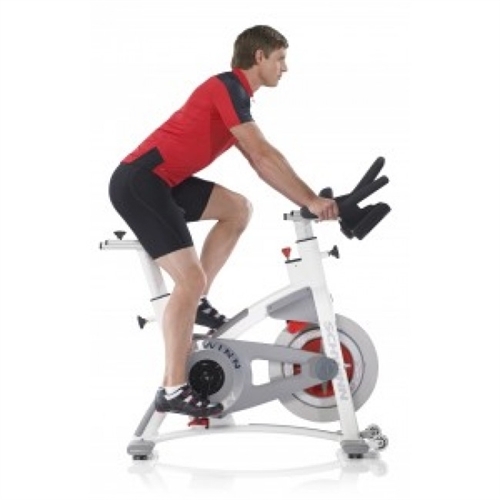 Schwinn Fit System: Customize your workout session with the Schwinn Fit System. This allows for even the smallest adjustments to be made to the bike so that proper seat heights and handlebar positions are ensured. Get an accurate, effective seat height with the Schwinn Fit System. Get a thorough recording of your session through an Mpower console. Brake safely every time with magnetic brakes that require little maintenance and won’t wear down with use. Store two water bottles within easy reach.